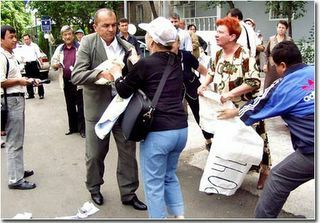 Uzbek protesters in the capital of Tashkent getting their signs ripped up by government agents on May 20th. On May 13th, 2005, Uzbekistan Military Personnel opened fire on a large group of demonstrators in the city of Andijan in eastern Uzbekistan. Still murky reports indicate that possibly 700 or more died during the violence. An official number may never be known due to the current regime’s secrecy and control over the state. But, observers witnessed three trucks and a bus filled with bodies of men, women and children being taken from the bloody scene. The world has not seen a similar massacre between governmental forces and protesters since the Tiananmen Square Massacre in 1989 in China. Today, international pressure is mounting on President Karimov to allow an independent inspection team to investigate the incident. So far he has resisted. Others are putting pressure on the Bush Administration to push the Karimov regime harder, saying this is where the rubber meets the road in regards to the Bush Doctrine. So, what will the US decide to do to pressure Karimov? The government has condemned the violence. But, if this is all that comes from the Bush Administration they will not pass the test of the unforgiving critics from the world press. This will also be a blow to the Bush Doctrine of spreading democracy and empowering opposition parties to overcome brutality. We will always be reminded that George Bush chose the benefits of cozying up to Karimov rather than supporting the oppressed people of Uzbekistan regardless of whether this is true or not. The Bush Administration needs to take more action to calm the critics. Years from now the world will look back at the violence of May 13th. Will they denounce the West led by the US for doing nothing more than condemn Karimov’s slaughter? Or will history see swift solid action taken by the US responsible for the collapse of another regime? France’s Charles De Gaulle once said countries don’t have friends or foes, only interests. For the Bush administration, the time has come for it to decide what its interests are in the most dictatorial nation in Central Asia, Uzbekistan. The Bush administration realists say the immediate need is to keep relying on the base to chase down Al Qaeda. But even the Pentagon wonders if that’s a thin reed. It’s taking the precaution of scaling back its operations at the airbase in the town of Khanabad because of the new political uncertainty in Uzbekistan. The Bush idealists have joined the UN and other international bodies in putting pressure on Mr. Karimov – who’s ruled ruthlessly since the former Soviet republic’s independence in 1991 – to let an international team investigate the massacre in the southern city of Andijon. That’s only a baby step, however, toward bringing a modicum of human rights to this nation. Mr. Karimov thinks he can weaken this foreign pressure by claiming he’s simply keeping radical Islamists from taking power in his Muslim nation. That argument carries less weight these days as more Muslim nations move toward democracy and discover radical Islamic groups either don’t keep their popularity at the polls or go moderate. The US, for instance, doesn’t buy that same line from Egypt’s leader Hosni Mubarak and is pushing him toward democracy. A (name your color) revolution in Uzbekistan, like recent ones in other former Soviet republics, still seems far off. But the US needs to more clearly show the way for Karimov to free his people of his tyranny. The Uzbeks can only hope the US is doing its utmost to accomplish this.